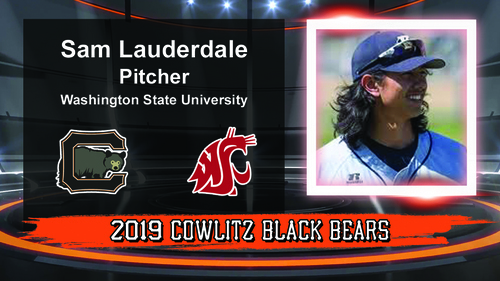 The Cowlitz Black Bears are pleased to announce the signing of Washington State University freshman Sam Lauderdale. Lauderdale is a talented left-handed pitcher for the Cougars. He has an upper 80’s to low 90’s fastball that he commands well with very good secondary pitches. Lauderdale is familiar with the area and the West Coast League. He is from nearby Vancouver, Washington, where he excelled in baseball and graduated from King’s Way Christian High School. He also played last season for the Portland Pickles, were he had a 1.08 ERA. Please join us and welcome Sam Lauderdale to your 2019 Cowlitz Black Bears!